I talk to so many women who are killing it in the gym or on their runs, are eating low fat/low calorie, and are generally “pretty healthy,” but they aren’t able to lose those last few pounds, get rid of belly fat and are thus, down mentally and emotionally. There a lot of old school fitness and nutrition theories that, unfortunately, aren’t holding their weight in 2018. Things that we were told or encouraged to do in the 90’s just doesn’t stand up or work after years of research or people not seeing results. 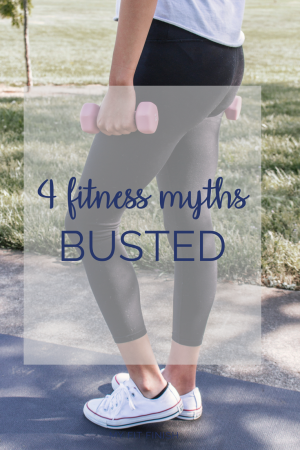 Here’s my top 4 fitness blunders I see everywhere and my response to them based on current trends, stats, and my knowledge from experience. We are creatures of habit so it’s no surprise that we will step on and off a scale daily to see “how we’re doing.” If you think about, your doctor makes you step on a scale, you did before you went to school…it’s ingrained in our brains that this number means something. Honestly, those numbers mean very little. The problem I see is that we attach worth about who we are and our identity is rooted in that number. We obsess over a difference in 1-2 pounds when we really know the scale can fluctuate based on time of day, how much water is in your body, and if you just worked out. My suggestion would be to measure your progress based on measurements, before and after photos, and seeing how your clothes fit. Your weight is merely just the gravitational pull the earth has on you! It has nothing to do with how wonderful of a person you are, how hard your workout was, and the type of friend you are. Start thinking about ALL that you are to people and that number will matter less! Again, a number is easy to gauge and easy to follow. It’s simple for me to tell you to only eat 1500 calories because you can plug in all your food and stay under that number. This photos is from my client and nutritionist, Emily Field who is an expert on eating the right macronutrients and fueling the right high quality foods over just couting calories. Your body needs certain fats, proteins, and carbohydrates to optimize fat loss and muscle building. You can eat under 1500 calories on 100 calorie snack packs but I think we all know there is little our bodies can use with foods like that. Aim to track your macros or if tracking stresses you out, eat whole, nutritious foods from the ground or an animal and see how you feel. I guarantee you will feel better and less restrictive. You’re talking to a huge fan of cardio and running so this one is a hard pill to swallow for me. I think because cardio sessions leave us sweaty, we feel like we’ve surely burned fat. But long-distance cardio like running actually works against fat burning. Our bodies quickly adapt doing this form of exercise and actually hold on to fat in self preservation mode. The best way to burn fat is to lift heavy weights because you burn more calories at rest vs running when you only burn during the exercise itself. Another way to incorporate running into fat burning would be to start doing sprints. The hard push + recovery makes it difficult for the body to adapt so fat stores are tapped! This one is my favorite. Ladies, it does not matter when you work out or even when you eat! It matters that you’re working super hard and do it every day. I would even advise you cut your 60 min workout to 20-25 of extremely hard work. I like to work out in the AM because it sets the tone for my day, clears my head, and gives me much needed “me” time. The most important part is scheduling in your workout every day and partnering it with your nutrition (but that’s for another blog). What other myths do you want busted in future blog posts?